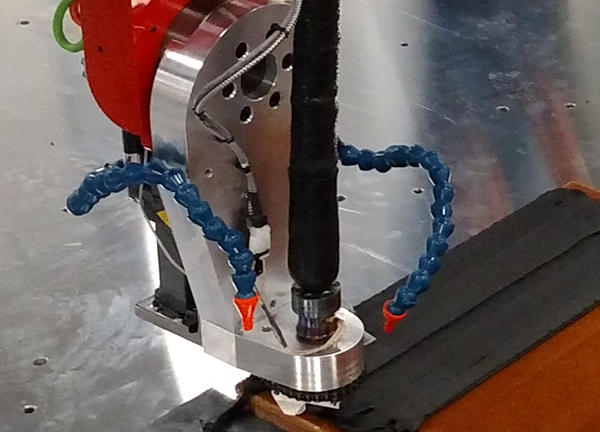 Thermwood Corporation, a major U.S. based manufacturer of CNC routers, has embarked on a program to develop Large Scale Additive Manufacturing (LSAM) which can perform both the “additive” and “subtractive” functions on the same machine. 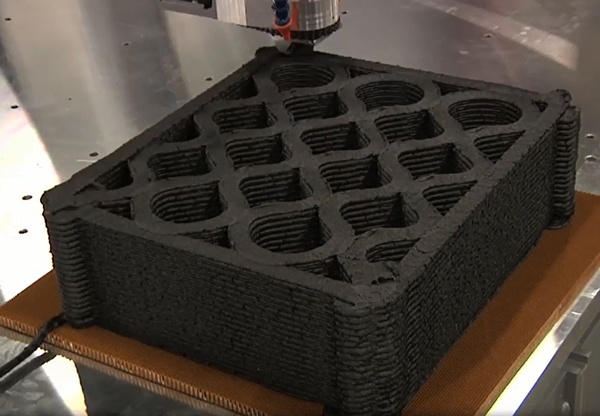 This approach, called “near net shape”, uses a high volume thermoplastic printer to quickly create a part that is nearly, but not exactly, the final net shape. A “subtractive” function then machines the part to the exact final net shape. In its final form, Thermwood’s system will perform both the “Additive” and “Subtractive” functions on the same machine. Thermwood’s development system has performed well during initial additive testing. It has been tested through its entire operating range. This startup effort included initial validation of an all new “MeltShape Technology”. Melt shaping promises enhanced control of layer shape and improved bonding between layers. This new patent pending approach uses one or more shaping wheels to shape, form and compress the hot plastic melt as it is being extruded, insuring that each new layer is the proper shape and thickness and that it bonds firmly to previously applied material. Melt shaping offers a new and promising technique in the advancement of large scale additive manufacturing. Kevin Slusarz, American Kuhne vice president of process technology, assisted with the start-up effort. American Kuhne, a Graham Group Company, supplied the custom extrusion system for Thermwood’s development machine. 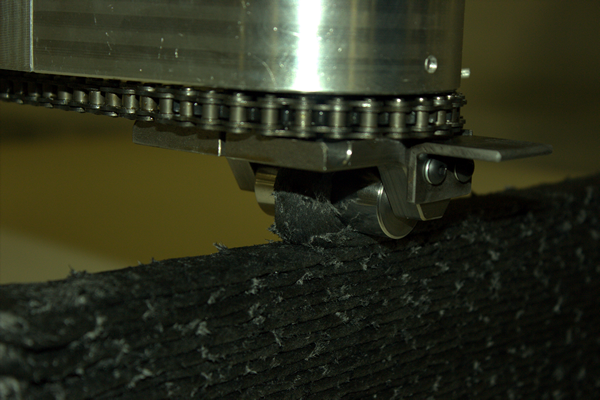 The extrusion system performed flawlessly during initial testing. Extruder controls are designed to smoothly network and integrate with the machine control. “We are quite pleased to have a partner like American Kuhne as part of this development program” says Ken Susnjara, Thermwood’s CEO. 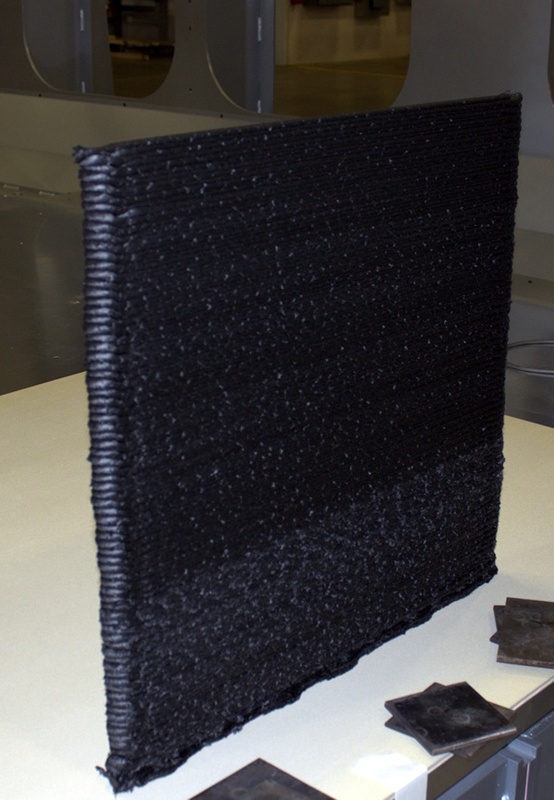 The material processed during startup testing was a 20% carbon graphite filled ABS from Techmer ES. Thermwood is in discussions with other material supplier to test their material in this new application. Thermwood’s melt shaping approach to adding material offers several significant advantages. Because layers are rolled together, rather than tamped together, air between layers is squeezed out during the additive process, so it is much less likely that air becomes trapped between layers. This was borne out during initial testing which produced virtually void free walls. This addresses the problem of trapped air delaminating layers when a part is processed through a heated autoclave, which is a common requirement for aerospace parts and patterns. This approach uses a melt shaping wheel that interact with the extruded thermoplastic bead while it is still hot and pliable. The shaping wheel is servo controlled so it can track the direction of machine motion. The Thermwood machine is a full six axis system, five axes to position the head in any orientation and the sixth axis to align the shaping wheels to the machine motion direction. Thermwood has added a software feature to its Q Core CNC control called “Tangential Following” which automatically keeps the shaping wheel aligned with the direction of machine motion without the need for six axis programming. This eliminates the need for a specialized CAD/CAM system to handle the sixth axis and allows the use of virtually any five-axis CAD/CAM system to program machine motion. Thermwood envisions different shaping wheels, each imparting specific characteristics to the hot plastic bead. Because of its five axis head configuration, material can be applied at an angle or onto a curved surfaces in addition to traditional horizontal layers. 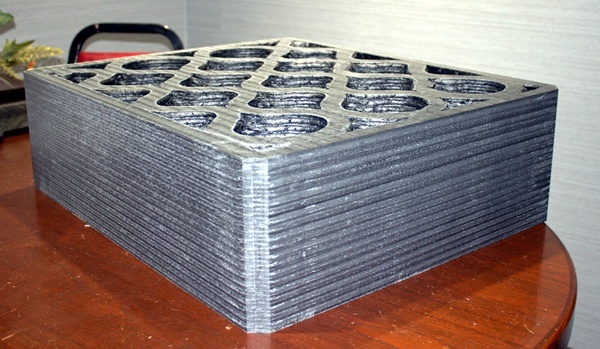 This capability opens new processing possibilities and supports free form additive manufacturing techniques not currently possible. 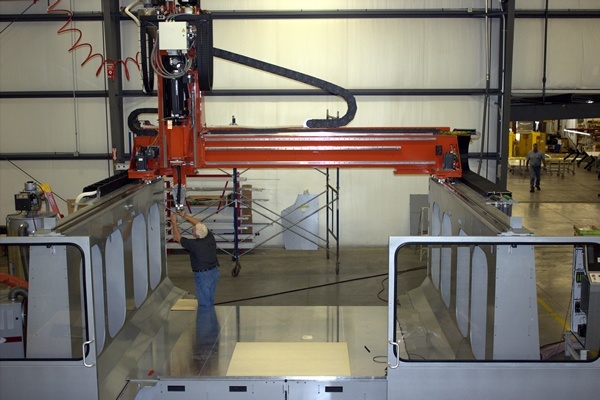 Thermwood’s initial test machine, which can print parts up to ten foot by ten foot by five foot thick, is expected to be fitted with a five axis “subtractive” gantry trim system in the next few months at which time all functions can be performed on the same machine. Thermwood plans to continue this development effort with the goal of offering these machines in a variety of large sizes for commercial applications. Management cannot yet determine when the technology might be sufficiently refined for commercial rather than purely research and development applications. In the meantime Thermwood plans to continue working with material vendors, R&D operations and potential users in an ongoing development effort.